Having a dinner that is both easy to make and delicious can be a challenge for families who are constantly on the go. Sometimes schedules don’t leave a lot of time to slave over the stove just to prepare one meal. I have just the idea for you. Try making cod fish. Fish is a great alternative to have instead of red meat. It doesn’t take nearly as ling to cook or prepare as other meats and has it’s nutritional value as well. Cod is a great fish to pop into the oven when the day is long. This is a fast and convenient recipe using cod fish fillets. The entire family, even the choosiest eaters, are sure to love this recipe. Here is how to cook cod. Read on for more information. Combine the first ingredients in a sauce pan or skillet. Turn the stove top to medium heat setting. Carrots, bell pepper and water go in the pan first. Cover the veggies with water. Allow to cook until they are tender. Drain the vegetables and set aside. Now, preheat the oven to 350 degrees. Coat your Pryex baking pan with cooking spray. Tear or cut off four pieces of parchment paper. The sections should measure (10×8. Place a cod fillet in the middle of one of the pieces of parchment paper. Top the fish with chives and lemon peel. Now, add a lemon slice to the fish and cover with the tender carrot and bell pepper combination. Next, sprinkle all the ingredients with fresh lemon juice. Fold the ends of the parchment paper over the cod fillets. Seal them in. Put them in the baking disk and into the oven. They cook for 15 minutes. You can also serve cod this way. Use the cooking oil to spray the a pan. Add garlic to the pan. Cook on medium heat for about a minute. Add the spinach and stir together well. When heated through, serve with the oven cooked cod fish fillets. Now, dish the cooked spinach on plates for the family. Slice open the cod fish fillet packs and vegetables. Add this to the plate. Dish out some of the sauce on top. 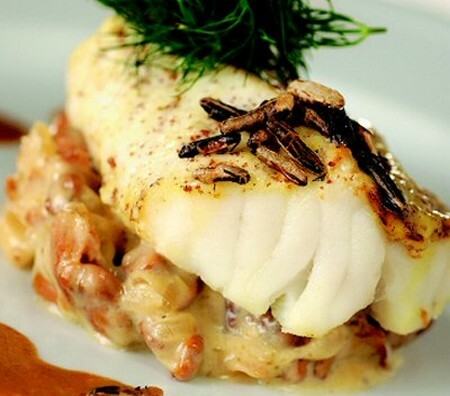 This cod fillet recipe is sure to be a family favorite. Please serve while hot and enjoy!